This channel is intended to provide informative analysis on significant developments and news related to intellectual property law. The content for this channel is developed by Banner & Witcoff attorneys. Banner & Witcoff is a national intellectual property law firm (www.bannerwitcoff.com). 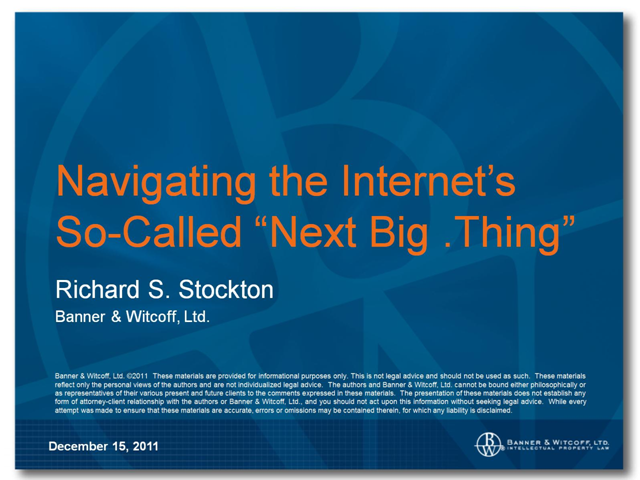 New gTLD Conundrums: Strategies for Navigating the So-Called "Next Big .Thing"
- Strategies for seeking new gTLDs, or handling others' pursuit of new gTLDs through objections or other means.